Julia Domna (170-217 AD): The daughter of Iulius Bassianus, priest of Elagabulus and Baal, Julia Domna was born in Syria in 170AD. She became the wife of a future emperor almost by accident, when a fortune teller told her that she would one day marry a king. Rumour of this reached the widowed senator Septimus Severus and, as the Romans were deeply superstitious, he sought her for his future wife. At the age of 16, she married the future emperor in 186AD. She soon became a firm favourite with Severus, as she had everything a future emperor could want in a wife looks, charm, wit, intelligence - and a cunning that would befit any member of the Roman political arena. And so this woman, sprung from the people and raised to a high station, who had lived her husband's reign in great unhappiness because of Plautianus, who had beheld her younger son slain in her own bosom and had always from first to last borne ill will toward her elder son while he lived, and finally had received such tidings of his assassination, fell from power during her lifetime and thereupon destroyed herself. After the brief civil war, Severus ascended to the throne in 193AD. In recognition of Julia Domna's years of devoted service, she was awarded the title of 'Augusta'. But not everyone was taken b the charisma of her character. The Praetorian Prefect C. Fulvius Plautianus had wide ranging powers bestowed on him by the emperor, maybe to ensure his wife would not dethrone the emperor while he was absent from Rome. 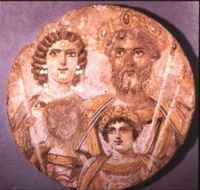 In what could be seen as a political move, Plautianus had his daughter marry Caracalla, thus ensuring he would always have direct contact with the emperors wife and so work to bring about an uprising against her. So greatly did Plautianus have the mastery in every way over the emperor, that he often treated even Julia Augusta in an outrageous manner; for he cordially detested her and was always abusing her violently to Severus. He used to conduct investigations into her conduct as well as gather evidence against her by torturing women of the nobility. For this reason she began to study philosophy and passed her days in company with sophists. As well as being a virtual co-ruler of the Roman Empire, Julia Domna also had the political intrigue and plotting within her own family to handle. It is known that her two sons were forever fighting each other in the political sense, but this escalated to a level that typified the devious nature of the Roman hierarchy. 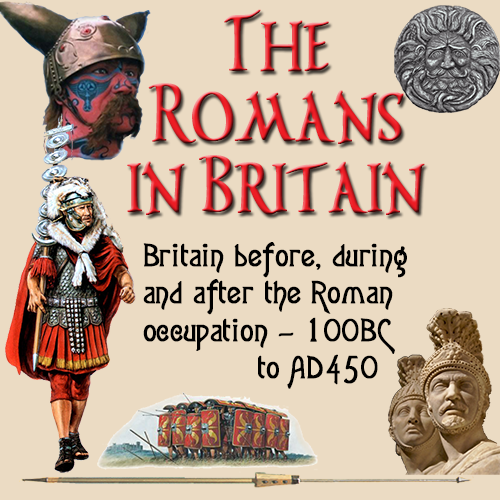 In 208AD, Severus came to Britain as head of the military to quell insurrection in northern Britain, and bought his family with him. He was a firm ruler but also corrupt and cruel. This streak of viciousness had been passed to his sons even before the fateful trip to England, Caracalla had plotted to kill both his father and bother on many occasions. In 211AD Severus died at Eburacum (York). His final instruction to his sons was 'Rule together as brothers, enrich the soldiers, and forget about everybody else'. This went unheeded and it was a year late after returning to Rome that Caracalla who was now co-ruler of the empire with his brother arranged the murder of Geta. The infighting amongst the Severus family was well known and even Dio wrote 'Thy house shall perish utterly in blood.' Julia Domna continued to assist her surviving son with administration of the empire. She was such an influence upon all concerned that her name was even seen on official documents seen by the Senate. When Caracalla was murdered by his successor, Macrinus, Julia Domna, then living near Antioch, planned to take-over of the throne and so become sole ruler of the Empire herself. Already ill Dio wrote that she was suffering breast cancer she apparently decided to commit suicide rather than carry out her plans to their final conclusion. She was reputed to have starved herself to death. Julia Maesa Julia's sister successfully organised a later coup which overthrew Macrinus and so enabled her grandson, Elagabulus, to assume the purple. In turn he was also murdered and this led to half a century of political war. 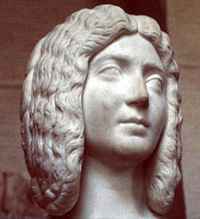 Julia Domna's epitaph was laid down by Dio who wrote. Hence no one could, in the light of her career, regard as happy each and all who attain great power, unless some genuine and unalloyed pleasure in life and unmixed and lasting good fortune is theirs. This, then, was the fate of Julia. Her body was brought to Rome and placed in the tomb of Gaius and Lucius. Later, however, both her bones and those of Geta were transferred by her sister Maesa to the precinct of Antoninus.